Hala are indigenous to Hawaii ranging as far as Australia. Fossil records show that they arrived here well before the first humans. The list of uses from this tree is extensive; the root made a dye, the leaves were woven into clothing, the fruits were cooked and eaten, and the fragrant male flowers were used as temple offering. These trees do well in coastal areas exposed to salt spray, as well as sheltered areas to be used as a landscape specimen. The early Hawaiians used hala extensively. Hala was planted from seed near houses. The soft aerial roots of female hala were used as cordage. The soft part of the male flowers (hīnano) were chewed by a mother and given to infants and young children as a laxative. Adults also used it for a laxative. The aerial root tips called “scales,” was pounded, juice strained and heated. 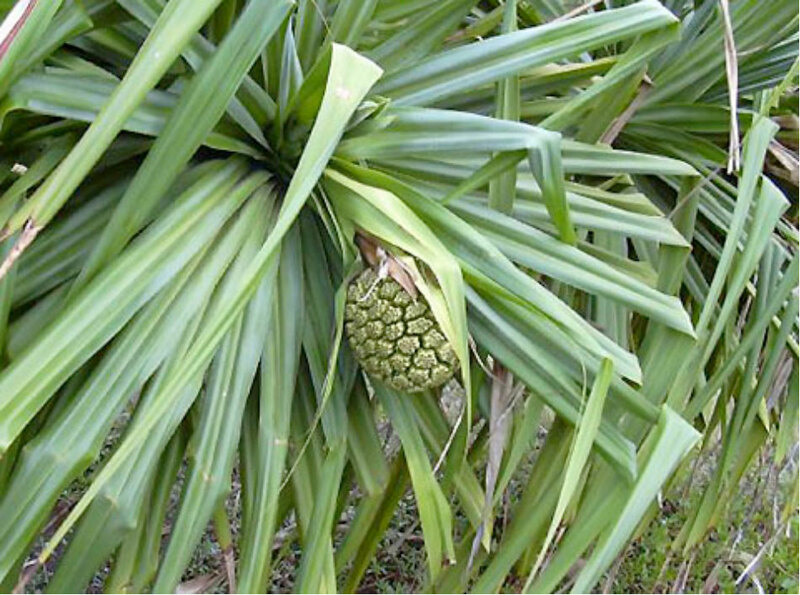 The mixture with kō (sugar cane) and other plants was used as a tonic for mothers weakened by child birth. The mixture was also given for chest pains. Very different from the female fruits (keys), the fragrant bracts of the male hala flower (hīnano) were fashioned into strikingly beautiful lei and were used with or without the flowers themselves. The wood was used for house (hale) construction and canoe rollers. The hard wood of male trees (hala hinano) is said to be beautiful but not as common as females. The softer wood centers were hollowed out and used for pipes to channel water from one kalo (taro) loʻi to another. The leaves were used in plaiting pillows, mats and mattresses. The bracts of hīnano (male flowers) were used in plaiting very fine textured and fragrant mats called moena hīnano. Hala leaves (lau hala) were carefully prepared by stripping off thorny edges, washed, soaked for several days, passed through smoke to soften, sun dried, lightly pounded with a bone tool, and rolled up. The Hawaiians also plaited the leaves for hats, roof thatching, sails, baskets, sandals (kāmaʻa), and fans to cool themselves. The fresh fruits were only eaten as famine food by the early Hawaiians. The keys of the form Hala pia were used medicinally. The dried keys (drupes, fruits) were also used as brushes for stenciling and for perfuming kapa. Hala. The common yellow to red keys. Hala ʻīkoi. Keys are lemmon colored at base; bright orange upper half. Hala lihilihi ʻula. Keys are bright yellow at base, changing to brigt red-orange at top. Hala melemele. Bright yellow keys. Hala pia. Small canary yellow keys prized. Hala ʻula. Orange red keys.